Cafe Du Monde. 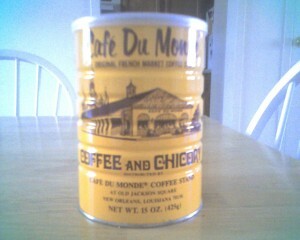 It is really great coffee with chicory (although I’m not totally clear on what that is). Last time I was in New Orleans I brought a can back with me. I figured $8.00 for the can was cheaper than flying to New Orleans to pick it up at a more reasonable price there. It was the only can they had and I don’t ever recall seeing it outside of New Orleans before, so I was pretty happy to get it. Plus, $8.00 for a can of coffee doesn’t seem to bad when you think of how many cups of Starbucks crap, I mean coffee, you can buy for $8.00. I’ll give you a hint, it isn’t many. So, for at least a week or so, we will have good coffee every morning (not that my normal coffee isn’t good, but this is a lot better). Leftover sushi is a perfectly reasonable breakfast, right? I did manage to resist having a piece of cake to go along with my breakfast. After all, cake with breakfast would just be weird.